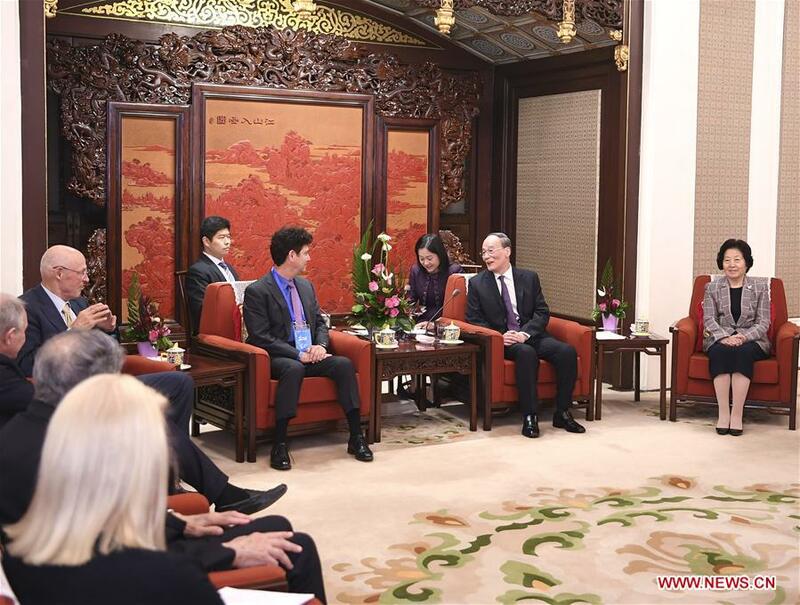 BEIJING, Oct. 12 (Xinhua) -- Chinese Vice President Wang Qishan met with members of the advisory board of the elite Tsinghua University School of Economics and Management in Beijing on Friday. "All countries in the world are closely linked. China will unswervingly deepen reform and expand opening up, constantly enhance mutual understanding of each other's history and reality through exchanges and cooperation with people of all countries, so as to deepen mutual trust, learn from each other, strengthen cooperation and work together to address common risks and challenges," Wang said. "China hopes that the board members will continue to actively participate in and witness China's economic construction and contribute to promoting exchanges and cooperation in various fields between China and foreign countries." The advisors, including Jim Breyer, chairman of the advisory board and Breyer Capital's founder and CEO, said China and foreign interests are blending deeply, and the foundation of mutual understanding, trust and respect is becoming increasingly solid. The board is willing to continue to make positive effort for China's economic development and education. Chinese Vice Premier Sun Chunlan also attended the meeting. The advisory board was founded in 2000 and consists of professors from foreign universities and CEOs from multinationals.